A new form of trading is taking the world by storm: social trading or mirror trading. It’s quite easy to explain and to understand: financial institutions (usually brokers) offer the opportunity to see what other traders are doing and copy their trades. The majority of retail investors suffer losses in the Forex market, but there are a few that can bring in consistent profits on a regular basis. They are the ones that learned to overcome their fear, greed and all sentiments that can interfere with successful trading, the ones that can manage risk properly and make money. Every new trader can evaluate those professional traders, choose one or more of them and, with the help of certain financial services companies or brokers, they can link their account to the one of the professional trader. Now everything becomes easy, because the trades taken by the successful trader are automatically copied into your account. Some financial services companies or brokers just offer the opportunity to manually copy the trades and with others, you can even switch off your computer because everything is done automatically. Next we are going to talk about some of the financial services companies or brokers that offer social trading/mirror trading services. Currensee. The company was founded in 2008 by software developer Asaf Yigal and Forex trader Avi Leventhal. Their goal was to bring a new level of transparency to retail trading and allow traders to see in real time what others are doing and share trading strategies. Traders link their live brokerage accounts to a Currensee Trade Leader. All the Trade Leaders are carefully tested by Currensee based on historical and real time live performance. You can allocate funds to each Trade Leader you are following and you can later modify the amount allocated if you see the performance of the Trade Leader dropping. You can also add or stop following Trade Leaders in real time. Of course, you can see the trades made in real time and Currensee gives you full control to manage risk. Ayondo also offers mirror trading, similar to Currensee. First of all, you have to select a top trader. You can find all kind of rankings on the Ayondo lists: the best trader for a certain currency in the last chosen period, or the best trader that closes his trades within 15 minutes, etc. Then, you add the chosen trader to your watchlist and from this moment you can see his actual Stop Loss and Take Profit levels. Live notifications let you know when a chosen trader enters a new position or modifies an existing one. You can add up to five traders to your watchlist and you can remove them whenever you want. If you want to copy automatically your chosen trader, you need a broker account with one of their partner brokers. Once that account is funded, you connect it to Ayondo and you can start copying your chosen traders. 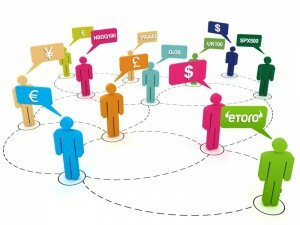 Among the brokers that offer social trading, eToro is worth mentioning. Their OpenBook platform allows you to see real trades, made by real people in real time and copy them. Think of it like a big network where the traders are constantly getting live feeds about the decisions of other traders. This way you can implement more information into your trading decisions and you are free to initiate trading discussions with other traders. With the CopyTrader feature, you can automatically follow your chosen trader, but you retain full control of your account and can exit a trade at any time or stop copying your chosen trader. As a new retail investor, you are in need of as much information and help as you can get and social trading offers you more than one opinion to help you make a better, more informed trading decision.